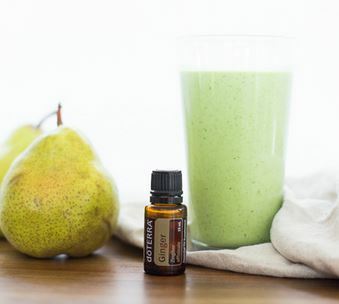 Taking green drinks to a whole new level of taste and wellness, our Ginger Pear Green Smoothie is packed full of vital nutrients, fibers, and minerals to keep your body fueled and functioning properly. This green drink is so easy and yummy—you’ll be craving it for breakfast, elevensies, and lunch. Spinach: Abundant flavanoids in spinach act as antioxidants to keep cholesterol from oxidizing and protect your body from free radicals, particularly in the colon. The folate in spinach is good for your healthy cardiovascular system, and magnesium helps lower high blood pressure. Studies also have shown that spinach helps maintain your vigorous brain function, memory and mental clarity. Almond Butter: Some of almond butter’s health benefits come from its calcium and copper content. Both minerals play a role in brain cell communication and keep your nervous system functional, while calcium also aids in muscle function and keeps your skeleton strong. Copper enables you to make melanin, which is a pigment that helps protects your skin from the sun. Put all of the ingredients in a blender and blend until creamy and smooth.